And then I had a dream about being with a couple of my peers in a place that had the distinction of being the actual Hell — although you wouldn't guess it, it was quite ok, if a bit boring and with few video games. I was getting familiar with a girl that was also living there. I was with Mugabe in a large bldg where I lived, and he may have also (even in the dream , I knew he had been deposed). We didn't get along that well, but we did talk a while. He said English was his 1st language , and spoke no others fluently. I was a little disappointed but I think i believde him. Hewbarnedme not to eat 2 loaves of bred, which had been specially prssrvdd and are somehow associated with the anti Mugabe forces. I trusted him on thag too. He was seated above me by quite bit, but I didn't associate that with power because there are a lot of stairs all over the place , azin many of my dless dreams , and I bE chosen to sit there myself . temfsld. Bannon freezing rivers on elevated platform. Was hologram? He was watching it himself from higher above. He said it was a hogram, but Len someone said Bannon would have no tech skills.which implied it was real. 20 men in bathroom at 4am...all are mEmbers of a band ğ" ymca".. said that bathroom was empty. I was playing a game similar to this but more complicated, and had different modes including a "Moon" mode in which the blocks glowed and dripping slime (although I think it was meant to be lava or some other cosmic substance) blocking my path and making the already difficult game even more difficult. And that wasn't all, because unlike the original game, where just surviving for 5 minutes was considered hard enough, each level in this game had a goal I was supposed to reach, which was high up in the level I remember, and I believe I had to follow a certain path and/or accomplish a certain task in order for my reaching the goal to be considered valid. And just to drive the masochism toi the extreme, each level was filled with large animals like dragons, of several different species, all of which would attack me and were invincible to the dripping lava, falling blocks, and other obstacles that were also attacking me. It seemed that, unlike the totally helpless protagonist of the original game, I could at least fight back, but I had no weapons and I came to realize quickly that there was no point in taking on 20 dragons or 20 wolves in hand to hand combat. I was playing a game similar to this, but the level I was playing had a bunch o secret exists. These, at leastr some of them, were aligned with politics, and I was going for the "right-wing" exit. Funnily enough, and probably on purpose, it turned out to follow the same path as the far-left exit most of the way, but then ducked out just before *that* secret exist to follow a different path to its own secret exit. Similar to a few video games, I think, particularly crowdsourced fan games of Mario platofrm games, where the difficultly level is whatever the player wants and therefore a secret can even contain another secret. I remember a guide walking me through the path, saying, at one point, "Still part of the Super Left!" As I was following the paht, I splipped, and fell down onto what was eitherh the normal path or the mainstream left-wing path. I could see the path I wanted just below me, but this game was a 2D type and the protagonist did not have a "crouch and fall through" ability like Mario does in parts of SMB3. So the two paths were closely aligned on puirpose, to give the player the realization that there is another way, but that, once on the mainstream path, there is no way to get to the secret path without backtracking or starting over. ancient Greek religion and one other were assessed as being superiuor to all other religs, including Abrahamic ones, in some categoryu of phjilosophy and it was recommended that people seeking enrichemtn of a particular kind come to consider themlsvbes believers in the ancient Greek relig and stuart fulling the practices. A guy I know from YouTube&other sites who disappeared awhile back turned up on Jeopardy and that was the reason why he disappeared. He also placed last, but considered it victory since he had beat many other hopefuls just to get on. I didn't recognize him at first. The contestants went by last names instead of first. 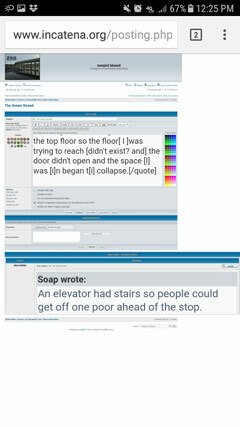 An elevator had stairs so people could get off one [fl]oor ahead of the[ir] stop. Th[e ]stairs led back around [to the floors?]. But I was on the top floor so the floor[ I ]was trying to reach [didn't exist? and] the door didn't open and the space [I] was [i]n began t[i] collapse. the ZBB isnt well optimized for mobile access andthats my main connection so i cant type very well. if Im not on mobile its because Im on this PC at my parents' house where neither the keyboard nor mouse works well. if i type coherently Ive either spellchecked it after Im done posting or prewrittten it somewhere else before posting. 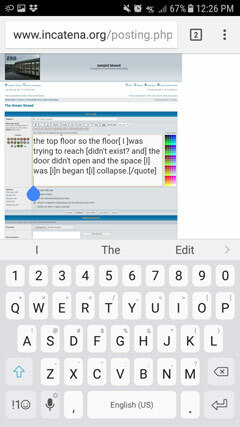 as for why i cant just spellcheck during the post itself, i thinm y phone it too slow ... it just doesnt seem to respond even when i manually thumbpress over a word. 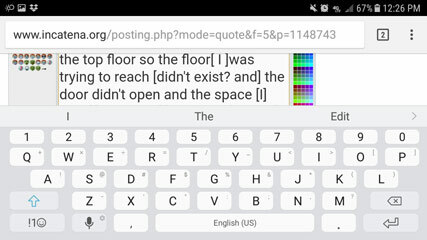 also, no, the thing at the bottom right corner that expands the edit window doesnt work on mobile because there's no click-and-drag. I prefer the newer phpBB which is much easier to use on mobile, but it seems that phpBB lacks the ability to have two different interfaces ... its iether everyone gets mobile, or everyone gets desktop.